Midsummer Rock is a television program based on the Cincinnati Pop Festival. The 90-minute TV version featured Alice Cooper, Mountain, Grand Funk Railroad, The Stooges, and Traffic. 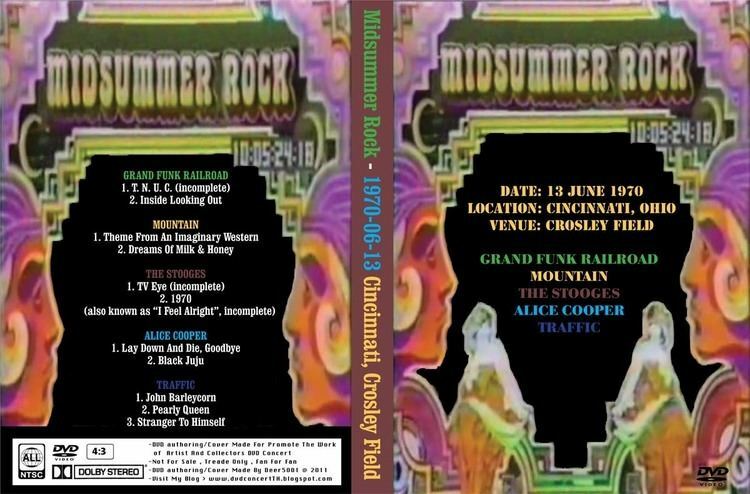 A rather thorough history of the Cincinnati Pop Music Festival that spawned the Midsummer Rock TV show is available on the Cincinnati City Beat website. The festival took place and was filmed on June 13, 1970 at Crosley Field in Cincinnati, Ohio, the home of the Cincinnati Reds baseball team since 1912. The Reds only had a couple more games to play there before moving to Riverfront Stadium downtown that summer. It was broadcast nationally in August of that year, but edited down to 90 minutes including commercials with 5 five acts being The Stooges, Alice Cooper, Traffic, Mountain, and Grand Funk Railroad. It was never rebroadcast. The video features now legendary performances by the Stooges, including stage diving and the peanut butter incident by Iggy, and a psychedelic-era Alice Cooper, where Alice received a cream pie in the face while he was attempting to hypnotize the audience. Poor quality videos of a couple of the acts have been available for years on youtube.com, specifically the Stooges, Alice Cooper and Mountain.